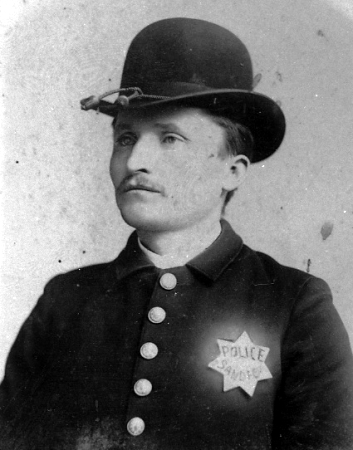 Bartholomew Moriarty was one of the original members of the department appointed June 1, 1889 and went on to become the first San Diego Police Captain. Circa 1911: Captain Moriarty standing with Antonio Gonzales who was the Chief of the 1838 Mexican Town Police and standing on the right is Chief Keno Wilson..
Obverse of badge reveals the jeweler engraved presentation. Officer Celebrates Twentieth Anniversary of Service Today - Mayor, City Attorney, Justice and Patrolmen Witness the Presentation of Handsome Gold Star as Token of Appreciation. 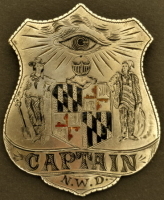 Captain Moriarty wore this 14k gold presentation badge from Jan. 17, 1908 until his retirement. At this time the badge had a retired panel added to it. Captain Moriarity proudly wearing his gold presentation Captain badge. 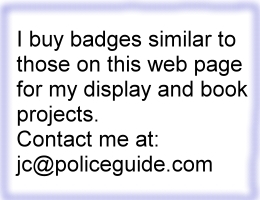 2nd issue style badge issued one year after the six point star to new officers. The six points continued to be worn by the officers who had them until 1889. The 4th issue badge #8. 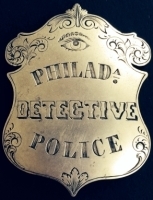 Circa 1890 sterling deputy sheriff badge made by Cummings SF. Circa 1925 sterling deputy sheriff badge. 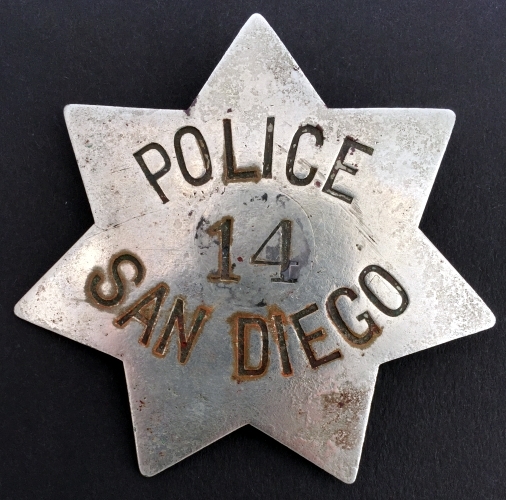 Early San Diego Police badge. Circa 1886.